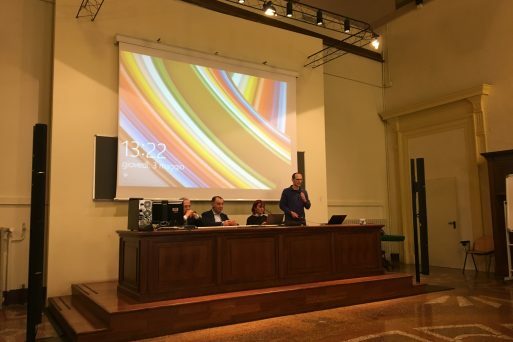 On Thursday 3 May 2018, at the University of Bologna, Faculty of Political Sciences, Prof. Massimo Di Menna led the lesson titled “Solidarity and social market”. The guest speakers Dr. Roberto Morisi (Director of the Bruto Foundation and Poerio Carpigiani), Dr. Mario Pantano (Representative Rotary Foundation) and Dott.ssa Valentina Gianni (Representative Agape Onlus) described the “Gelato is solidarity in Mozambique” project. At the conclusion of the course, two groups of university students each illustrated diverse business plans related to projects described regarding “Gelato is solidarity in Mozambique”. One of the subjects of the lesson proposed by Prof.Di Menna was to to introduce the students to the unique life paths of each of the guest speakers, to be models for the future generations that are entering the work force. Other subjects covered during the course was related to practical methods for enacting social enterprise models and specifically related to gelato and pastry shops particular as well as how each students can make a personal contribution. Dr. Mario Pantano, a representative of the Rotary Foundation, presented the Rotary Foundation as “the donor operative arm” and illustrated its functions. More info: https://www.rotary.org/it/about-rotary/rotary-foundation. He described the phases, the training and the supporters of the project “Baking, Pastry and Gelato Art Training Center” in Mozambique in favor of a center managed by the Scalabrinian Sisters of Ressano Garcia. The Rotary Bologna Valle dell’Indice promoter of the Global Grant n.1758744 financed the project worth $97,000 with its own resources and collecting contributions from: Rotary Foundation, District 2072 R.I. Emilia Romagna-San Marino Republic, Bruto Foundation and Poerio Carpigiani, by Rotary Felsinei, by Rotary of San Miniato, by the Argentina Rotary District 4905 and by the non-profit organization Agape and has activated the collaboration for the on-site management of the Project with the Rotary Club Polana di Maputo and with the District 9400 Rotary South Africa-Mozambique 9400. They also contributed to the training on pastry Gino Fabbri (President of the Italian Academy of Confectioners) and Nicola Fabbri of Fabbri 1905, through the Fabbri, Masterclass and School of Taste laboratories. Being permanent, the Trading Center will have the objective of involving and training young people, their families and in particular their rotating mothers. <The goal of the project “Gelato is solidarity business in Mozambique”>, explains Dr. Morisi, Director of the Bruto Foundation and Poerio Carpigiani, <it is aimed not to give gelato at more competitive prices or to give it away, but for the people who will work there. Training of people who can start with the gelato and pastry but also training of future educators. Each member of this project will be able to spread their new skills and knowledge along with the aid of existing educators to ensure training and quality. This efforts will ensure the transmission of skills and know-how to the designated regions to further grow the initiative as well as generating funds to access high levels of education in the future. Dr. Valentina, whom represents Agape Onlus in both Mozambique and South Africa, shared her exciting and touching experiences. She explained how the idea of ​​solidarity gelateria was born. The goal was to find a solution to the problem of donation reductions in Italy and to try to support the existing expenses for existing charities. She explained that to date Mozambique is rapidly growing but this is not accompanied by employment growth. Currently, many business projects are underway that can allow the Mozambican mission to be able to manage costs and manage funds that can finance, at least in part, scholarships to be able to attend the university, or starting up new businesses. Prof. Massimo Di Menna made himself available for future consulting and to revise forecasted income statement plans. He will also depart to Mozambique to teach the future members of this project the feasibility and simplicity of this business project. May 15, 2018 | Filed under Uncategorized @en.